What information is included in an export? 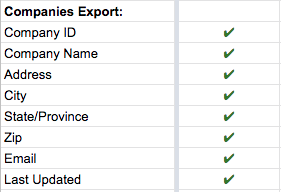 Exports vary based on what type of record you're trying to export. Note: You must purchase export credits prior to having the option to export data from the Cannabiz Media license database. The cost per export credit will vary depending on your subscription plan ($3/credit on Business, $2/credit on Business+). Exports are not available on the Startup plan. 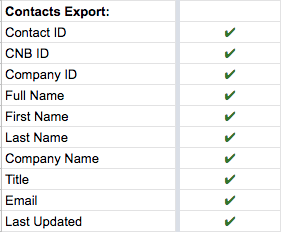 Exporting is a powerful tool that provides a plethora of information on Licenses, Companies, and Contacts within a CSV file. The charts below detail what data you’ll receive via each individual export view. 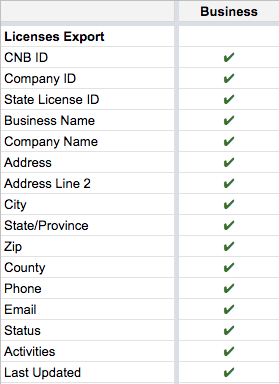 Note: There may be more than one CNB ID or Company ID for a particular record if they are associated with more than one license or company.